View of parlor, ca. 1882. Photograph by Jackson & Kinney; courtesy, Maine Historic Preservation Commission. 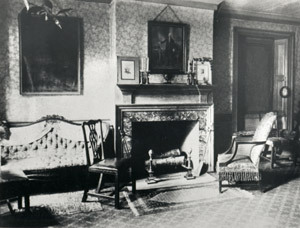 The parlor was always the best room, used by the Wadsworths and the Longfellows regularly as well as for special formal occasions. For example, Zilpah Wadsworth, the poet's mother, wrote during her childhood of the reading and musical events that occurred here. This room is where her sister Eliza Wadsworth died in 1802 and where the Wadsworth and Longfellow daughters were married. Furnished with portraits of Stephen Longfellow and Henry Wadsworth Longfellow as well as landscape paintings, engravings, and stylish furniture, it appears much as it did after Longfellow's death in 1882, when it was photographed for the Longfellow Remembrance Book. >George Washington, 1732-1799. This engraving of George Washington is over the mantle in the parlor of the Wadsworth-Longfellow House. By then, some furnishings had achieved heirloom status, including the colonial Boston chairs inherited from Stephen's parents, the 1808 Portland lolling chairs, and the 1801 Edward Savage print of George Washington in its historic location over the mantle. Three images of Evangeline, the heroine of Henry's epic poem, also decorated the parlor. The 1855 engraving by James Faed, which is still on display, was, according to Anne Pierce, "the first one made after the Poem came out." Several different pianos were integral parlor furnishings over the years. The poet's Bellisent flute from Paris and early American music books with family annotations are in the collection. In the corner, Anne nurtured an orange tree that had "grown old with age." In the parlor, as in the rest of the house, the woodwork is painted in what was then in favor, "quiet, neutral tints" — fawn, drab, stone color, and gray — "pleasing and harmonious" colors. In both the parlor and the sitting room, polychrome or two-toned paints highlight the architectural details of the moldings and doors. The high-gloss oil-based paints used in the renovation undertaken in 2000-2002 simulate the shiny, lead-based paint long favored by Americans.